Tantrix Gobble is the latest version in the evolution of Tantrix, following on from the Tantrix Game Pack. It includes all the best features of the Game Pack, plus some significant improvements. The main addition is an interactive party game for up to six players. It is frantic, high-speed fun, rewarding quick thinking rather than careful strategy. Other improvements include: a friendly instruction booklet, a softer bag, and sculpted tiles which are easier to handle and pick up. Great for the whole family. The Discovery is our most addictive puzzle creation yet! As a progressively challenging solitaire activity it was singled out from the Game Pack to provide the perfect introduction to Tantrix. The concept is simple: Ten tiles numbered on the reverse from 1 to 10. Start with three tiles, then slowly increase the difficulty by adding more tiles - it's guaranteed to hook you. Contains 10 hexagonal tiles in a wood or chrome stand. The puzzle is designed to sit on your coffee table and drive your guests to distraction. Also available in a black mesh bag. The Discovery is the best way to learn about Tantrix concepts and improve your spatial skills. This is the one to start with! 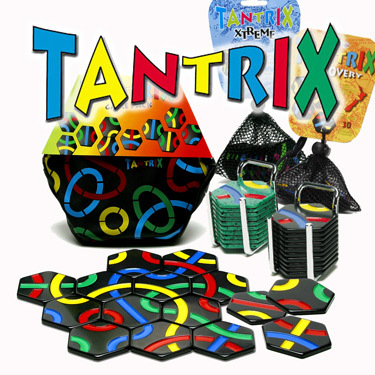 Tantrix Match is a new puzzle concept designed to train your spatial and logic skills whilst providing heaps of fun. Match contains 13 unique tiles, a wooden tray and a selection of puzzle cards sequenced in order of difficulty from easy to extreme. There are lots of ways you can use your powers of deduction to help you find the solutions! With over 22 million puzzles possible, the difficulty of each puzzle is determined by the number and position of pre-placed tile clues. To play, a card is placed into the tray, the starting tiles are copied and the puzzle is solved by fitting the remaining tiles to make all colours match. Three additional sets of puzzle cards are available for Tantrix Match. Each of those "add-on" packs contains 12 cards of increasing difficulty and is suitable for all ages. 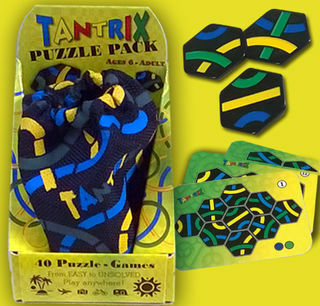 Student and Family packs are aimed at people without any prior experience at solving Tantrix puzzles, whereas the Expert set starts off at a moderate level and quickly becomes very hard, which makes them more suitable for Tantrix fans and puzzle enthusiasts. Student Pack: Mostly easy to medium difficulty. Family Pack: A range of difficulties from easy to hard. Expert Pack: Mostly medium to hard difficulty. A lightweight travel version of the popular Game Pack, inspired by the inventor's mountaineering friends. A full Tantrix pack weighs around half a kilo, and after carrying a standard set to high altitudes in the Himalayas, there had been demands for an "alpine" edition which just couldn't be ignored. 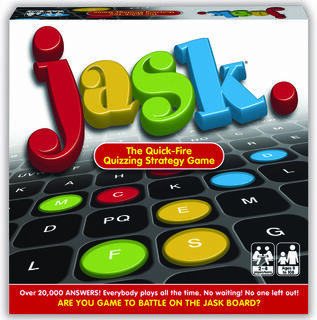 The new pocket edition contains all the puzzles and games of the standard-sized set, yet only weighs 120 grams. The tiles are still hand painted and made from a virtually unbreakable synthetic resin. It's handy size and light weight makes it the perfect set for posting or travelling overseas.